As a business executive, whether you have visited London before or it is your first stay in this large metropolis, it’s important that you choose the perfect accommodation so you feel as settled as possible. Likewise, if you are a PA booking a place for your executive to stay during their trip to London, it’s imperative to thoroughly research the options available to ensure a comfortable trip. Read on to see how a serviced apartment can provide a home away from home during a business trip to London. Partnering superior convenience with professional service, a serviced apartment can provide you with everything you need for an enjoyable, productive stay. Whether you have scheduled a short-term stay in London or you plan to visit the capital for a prolonged period of time, the facilities and amenities available to you can create a more comfortable stay. Along with restaurants and bars, local amenities such as supermarkets and shopping centres can make for an all-round enjoyable and pleasant experience, giving you the chance to settle into your surroundings, no matter the length of the stay. Located in Vauxhall and Stratford, Staybridge Suites provide three socials per week, with complimentary drinks and snacks in the evening for residents to mingle with other guests. Breakfast is included in the nightly rate and there is a ‘chilling’ area for guests on the ground floor, complete with a television, computer area and games. This accommodation has a dedicated space where guests can relax with a drink in their modern chill out space; the perfect place to plug in your laptop, relax in front of the TV or unwind with friends. 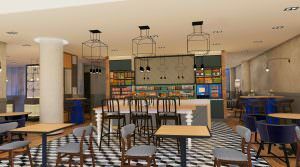 People staying here will benefit from The Meeting Centre which features a contemporary, spacious break-out area and pantry, along with multiple comfortable seating areas. This provides the ideal place to greet guests or refuel with a cup of coffee. From PAs to business executives, we provide each and every client with a reliable, unbiased service, ensuring they find the most suitable accommodation for a business trip to the capital. To find out more or book an appointment, don’t hesitate to get in touch today.